Are you looking for a tax savings calculator? This template is the perfect solution for anyone looking to calculate the proper tax withholding. It’s also a perfect solution for contract workers or any worker who pays their own taxes. Use this tax savings calculator to accurately pinpoint the correct amount of taxes you need to withhold. Employees will be able to accurately gauge the amount of taxes that should be withheld from their paycheck to avoid over or underpaying. The tax savings calculator includes fields for salary and tax information and separate fields for a number of common deductibles, insurance payments and expenses that can be used as tax write-offs. Like all of our templates, we offer this tax savings calendar as a free download as a service to our visitors. No matter what field you work in and whether you are a contract or w2 employee, this tax savings calculator will help properly ensure the right amount of money is being held for taxes and all possible deductions are accounted for. If this tax savings calculator has helped you, please feel free to share this page and spread the word about our collection of free templates. We strive to be the industry leader in free templates, calculators and spreadsheets. Download this tax savings calculator today to ensure you never underpay your taxes again. This template is ready-to-use. 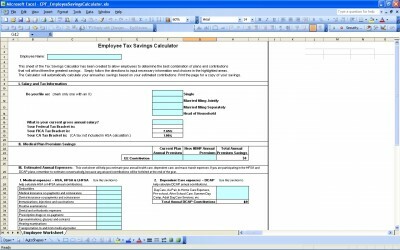 Simply download and open the file and you will be ready to start using this tax savings calculator in minutes. Make life easier and stop owing Uncle Sam all your hard earned money. Don’t forget, if you enjoy this tax savings calculator, check out some of our other templates.